Plus: Which county has more roads than any other county in Ireland? $325 million: The amount that baseball player Giancarlo Stanton will make after signing the largest contract in sports history during the week. 113,500: The number of outstanding arrest warrants in Ireland. €70,000: The amount that NUI Galway has been ordered to pay to a lecturer who was passed over for promotion. 12,330: The number of kilometres of road in Cork, more than any other county in Ireland. 3,500: The number of people who have signed a petition as of Wednesday to stop Julien Blanc, a notorious pick-up artist who condones aggression towards women, from entering Ireland next year. 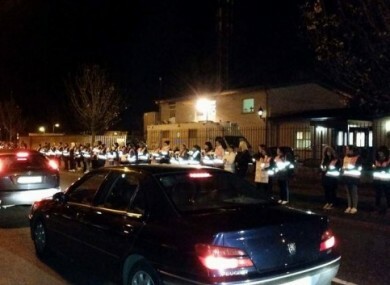 200: The estimated number of women who gathered outside Coolock Garda Station on Tuesday night for a candlelit vigil over police tactics at water charge protests. €150: The amount that nurses are being asked to pay for their registration fee – and they aren’t happy about it. 31: Where Ireland ranks on a UN list of countries with low maternal mortality rates. 25: The age of Elaine Burton, the woman who is marrying notorious killer Charles Manson. 21: The number of pieces of metal in Bono’s arm. 3: The number of government ministers who cancelled or didn’t show up to interviews with reporters from America’s National Public Radio – and the journalists weren’t happy. 2: The number of threats made to Environment Minister Alan Kelly’s constituency office, including a phone call in which the caller threatened to ‘put a bullet in his head’. Email “Water protests, death threats, and Bono: The week in numbers”. Feedback on “Water protests, death threats, and Bono: The week in numbers”.